Your body needs calcium, magnesium, sodium, phosphorus, potassium, sulfur, and chlorine in significant amounts. And then, there are elements like iron, zinc, copper, manganese, molybdenum, cobalt, chromium, and fluorine, which are called the trace elements. Your body needs them too – but in minimal quantities (<5 mg). An important member of the trace elements is Selenium. If you read on, you will know what role it plays in your body, the best dietary sources, how much selenium your body needs and other details. Game? Scroll down and get ready to take notes! Before we get to the sources of selenium, let us understand the role of selenium in our body. 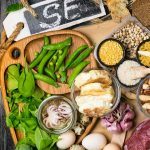 What Is The Role Of Selenium In Your Body? Selenium is a trace element that is naturally present in many foods and is also available as a dietary supplement. It is a constituent of more than 24 selenoproteins that play critical roles in several biological and physiological processes. 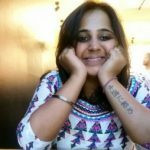 How Much Selenium Do You Require Per Day? The recommended dietary allowance (RDA) of selenium depends on your age, which is directly proportional to the demand (1). Take a look at the table with more details. Selenium is measured in micrograms (mcg). And where can you get all this selenium? Of course, through your diet! Selenium is a mineral that can be found in a variety of foods – veggies, meat, dairy products, etc. We have compiled a list of selenium-rich foods to make your life easier. Make a note of your favorites and frame a diet with those foods. A simple mix-n-match! Ready? Here we go! 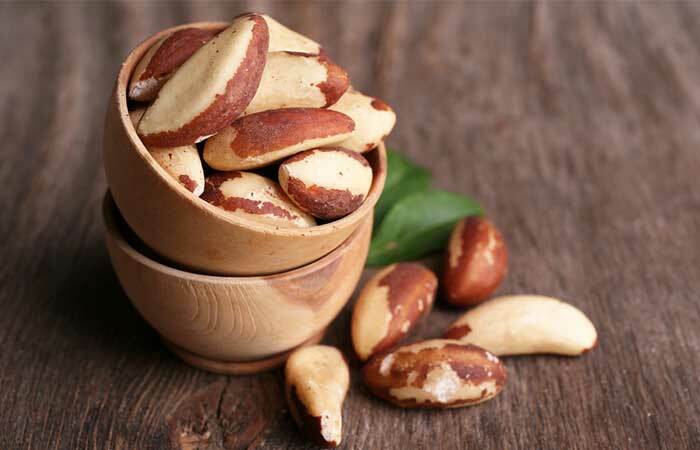 Brazil nuts are the richest dietary source of selenium. They contain about 1917 mcg of selenium per 100 g serving. These nuts also have significant amounts of magnesium, copper, and zinc. Studies show that having 2 Brazil nuts every day can improve the selenomethionine levels in the body (2), (3). In fact, adding Brazil nuts to your diet may help you avoid the need for supplements altogether. The fruit body of some species of wild-grown edible mushrooms is naturally rich in selenium. The Goat’s Foot (Albatrellus pes-caprae), with an average of about 200 mcg/g (dry weight or DW), is the richest one. King Bolete (Boletus edulis) contains approximately up to 70 mcg/g DW, and the European Pine Cone Lepidella (Amanita strobiliformis) has up to 37 mcg/g DW. The Macrolepiota species, with an average range of about 5 to < 10 mcg/g DW, and the Lycoperdon species, with an average of approximately 5 mcg/g DW are other additions to the list of selenium-rich mushrooms (4). Even more common mushrooms such as button and champignon, are rich in selenium. Most varieties are! Another dietary source of selenium is beef. All the cuts of beef have high selenium – the liver, striploin, round, shoulder, and brisket. A study compared the bioavailability of selenium from beef diets with that of selenium as selenite or L-selenomethionine in yeast diets. It showed that selenium in beef diets was better absorbed than the rest (6). Three ounces (100 g) of whole and raw beef brisket has 16.4 mcg, beef liver has 39.7 mcg, ground beef meat has 13.5 mcg, beef ribs (6-12, all grades) have 16.2 mcg, the bottom round has 24.8 mcg, and tenderloin of all grades has 26.9 mcg of selenium. Apart from vitamin B, magnesium, phosphorus, copper, and manganese, sunflower seeds are a great source of vitamin E and selenium. 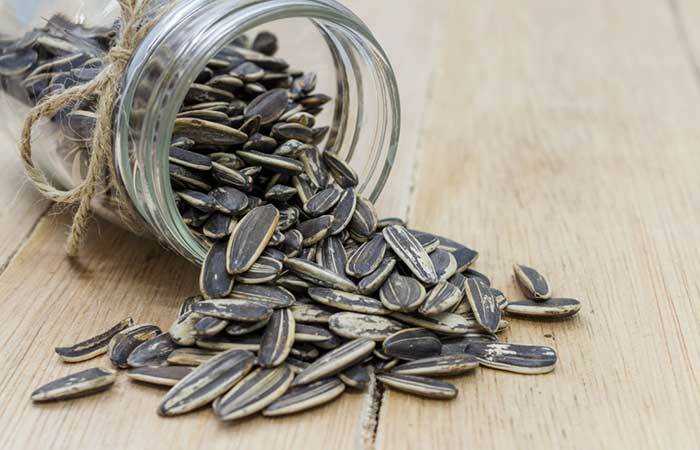 100 g of dried sunflower seed kernels contain about 53 mcg of selenium. Sunflower seeds have very low cholesterol and sodium and hence are a healthy snack. Fresh whole eggs contain vitamins B, A, and D, minerals like iron, phosphorus, and selenium, and abundant protein. One medium-sized whole egg (45 g) has 13.9 mcg of selenium, which makes up about 20% of the daily value. A large boiled egg has about 15.4 mcg of selenium. So, make sure you include at least one egg in your breakfast every day. After hulling the husk and a few bran layers of rough rice, you get brown rice (which, upon further processing, gives you ‘white rice’). 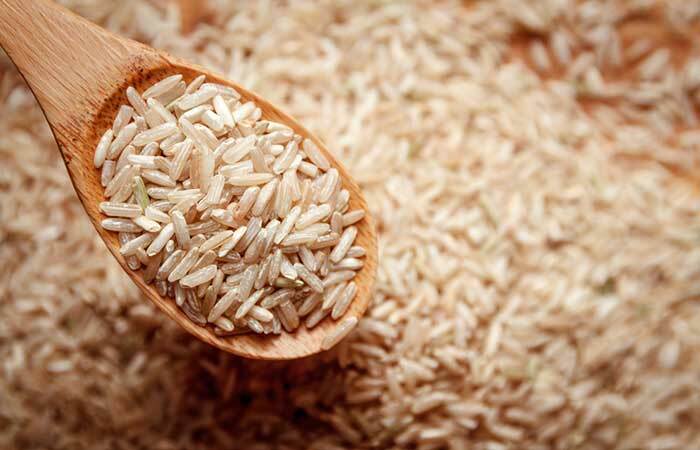 By limiting the degree of milling, most of the nutrients can be retained in brown rice. One major advantage this rice has over white rice is that it has high levels of phytochemicals and trace elements like selenium (6). Hundred grams of long-grain variety of raw brown rice has 23.4 mcg of selenium. And after cooking, the same variety has about 10 mcg of selenium, besides manganese, potassium, magnesium, and phosphorus. Bread and pasta are a staple in many countries across the world. There are a wide variety of flours available today that are used to make bread and pasta as per your choice. Gluten-free variants of flour, baking mixes, flakes, breads, snacks, etc. are all included here. Like Brazil nuts, cashews are rich in selenium – 100 g of raw cashew nuts contain 19.9 mcg of selenium – along with magnesium, copper, and manganese. They also contain high levels of fats (about 48.3% of total weight) – of which about 62% is monounsaturated fats, 18% is polyunsaturated fats, and 21% is saturated fats. Cashews also contain essential phytochemicals like sitosterol, campesterol, cholesterol, and avenasterol, and amino acids like glutamic acid, aspartic acid, leucine, valine, cysteine, methionine, and tryptophan. Vitamin E is the most abundant vitamin, followed by vitamins B3, B5, provitamin A, and B12 (7). Lentils have an excellent macro and micronutrient profile and favorable levels of mineral bioavailability enhancing factors too. They are quick-cooking and have minimal precooking processing requirements compared to other pulses, oilseeds, and cereals. Hence, they are consumed as a whole food in more than 100 countries. 100 g of dry lentils would provide 26–122% of the RDA. Almost 86 -95% of the selenium in lentils is in the form of organic selenomethionine, with a smaller portion (5-14%), as selenate. According to plant ecological studies, the lentil varieties produced in Australia, Nepal, and Canada have the highest selenium content. And the lowest is from the ones produced in Syria, Morocco, and Northwestern USA (8). This is our list of selenium-rich foods. From Brazil nuts to beef, brown rice to lentils, there are a wide range of options to choose from to fulfill your recommended quota of selenium. 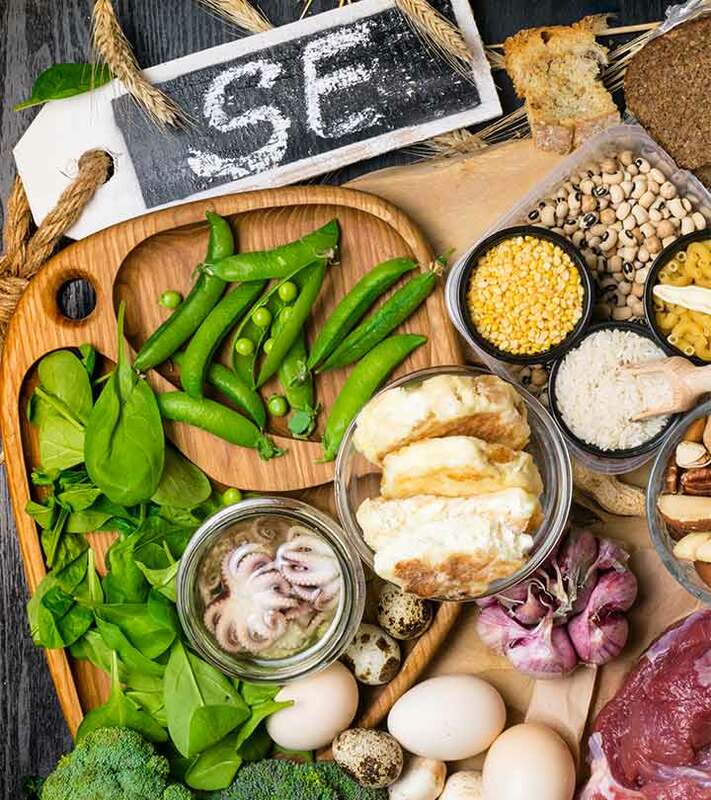 Since the selenium content in these foods depends on the amount of selenium in the soil, several other factors, such as soil pH, amount of organic matter in the soil, and whether the selenium is in a form that is amenable to plant uptake play an important role. Ideally, organic soil that has been rotated over time to replenish the nutrients will have a higher overall selenium content. In other words, the selenium content of the soil affects the amounts of selenium in the plants that animals eat, so the quantities of selenium in animal products also vary. However, selenium concentration in soil has less of an impact in animal products than it does in plant-based foods. This is due to animals maintaining more predictable tissue concentrations of selenium through homeostatic mechanisms. Pick your favorites from our top 10. Play around with the plant and animal-based selenium sources and create a diet or cook a dish. Please write to us about your experience and share your recipes. You can also share your feedback about this article and relevant comments in the box given below. We’d love to know what you think about our top 10 round-up. “Selenium” Fact Sheet for Health Professionals, Health Information, National Institutes of Health Offices of Dietary Supplements. “Brazil nuts: an effective way to improve selenium…” The American Journal of Clinical Nutrition, US National Library of Medicine. “Brazil nuts: Nutritional composition, health benefits…” Food Research International (Ottawa, Ont), US National Library of Medicine. “Selenium in edible mushrooms” Journal of Environmental Science and Health, US National Library of Medicine. “Selenium from beef is highly bioavailable as assessed…” The British Journal of Nutrition, US National Library of Medicine. “Phytochemical profile of brown rice and its nutragenomic…” Antioxidants, US National Library of Medicine. “Nutritional composition of raw fresh cashew…” Food Science & Nutrition, US National Library of Medicine. “The potential of lentil (Lens culinaris L.) as a whole food…” Euphytica, Springer Science.